The Burren and Cliffs of Moher Geoparks Universal Access project with the Brothers of Charity, Ennis and local heritage guide Tony Kirby has just been shortlisted for an AONTAS STAR award. The project which is funded through the GeoparkLIFE programme, saw Brothers of Charity Service users and support staff participate in guided tours of a number of well-known tourism landmarks including Aillwee Cave, Poulnabrone, Caherconnell Fort and Slieve Carron. Feedback from project participants will be used to identify locations that can be easily accessed by people with disabilities, as well as to develop itineraries and programmes tailored specifically for small groups who wish to engage with the locations as learning spaces. 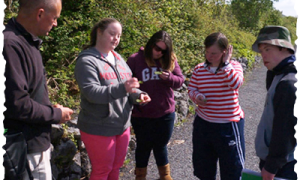 The feedback will also guide the development of suitable training for local tour guides and teachers wishing to work with these groups in the Burren. “Not every location in the Burren will be accessible but a number of locations are demonstration sites under the GeoparkLIFE project. We are working to make these sites accessible to as many groups as possible in terms of practical access and also from an educational standpoint,” explained Carol Gleeson, Project Manager, Burren and Cliffs of Moher Geopark. Kevin Delaney, manager of the Brothers of Charity Streetwise Training Programme in Ennis, was part of the team that established the partnership for project. “We strive at every opportunity to explore inclusion and access for our students. Working with small groups of students in this way ensures the outcomes are always learner focused and driven. The students who took park in the pilot project embraced the opportunity to explore that which is on their doorstep and each of them rose to the challenges presented by access and interpretation, which the rest of us can so often take for granted,” stated Mr. Delaney.